Martin Frobisher was exposed early to the dream of a short route to Cathay, which gained impetus in the face of collapsing export markets for English woolens. Two trading voyages to West Africa hardened the young seaman, while a Portuguese pilot's boast of sailing through a North West Passage may have alerted Frobisher to this route to fame and wealth. The Muscovy Company had failed to exercise its monopoly for northwestern trade and had denied Humphrey Gilbert's petition to do so. However, with the support of Queen Elizabeth I, the Earl of Warwick, and other members of Court, as well as the financial backing of Michael Lok, one of its directors, the Company was persuaded to license Frobisher's attempt to seek a North West Passage to Asia. Lok supplied the expedition with navigational instruments, and Dr. John Dee instructed Frobisher and his second-in-command, Christopher Hall, in their use. Frobisher left Deptford on June 7, 1576 aboard the 20-ton Gabriel, accompanied by the 25-ton Michael, commanded by Owen Griffin, a 10-ton pinnace, and a total complement of 35 men. They reached the Shetland Islands on June 26, and sailed west until July 1, when they mistook Greenland for Friesland, an imaginary island that misled cartographers and mariners for another two centuries. Unable to land, the Gabriel sailed on through a storm that sank the pinnace with its crew of four, and caused the Michael to turn back. After arriving at and naming Queen Elizabeth's Foreland (Resolution Island) on July 28, Frobisher reached Baffin Island, entered the bay upon which he bestowed his own name, and concluded from the tidal flow that it was the Passage. Frobisher spent a fortnight exploring the first 40 leagues of Frobisher Bay and trading with the Inuit, until they captured five of his crew. Reduced to a crew of 13, and deprived of their ship's boat, Frobisher responded by taking an Inuit hostage, but failed to negotiate an exchange before weighing anchor for England with the captive and his kayak. Although the Inuk died soon after reaching London on October 9, he was a public sensation. A greater sensation attended a black stone that Frobisher presented to Lok, who consulted three assayers before finding one who declared the stone laden with gold. A second expedition was organized to return to the Arctic, mine more ore, and, only incidentally, search for the North West Passage. On May 25, 1577, Frobisher, as High Admiral of the newly chartered Cathay Company, left Blackwall aboard the 200-ton warship Ayde (supplied by the Queen, who invested more heavily in this voyage than its predecessor), accompanied by the Gabriel, commanded by Edward Fenton, and the Michael, under Gilbert Yorke, Frobisher's cousin. The three ships' complements numbered about 120 men, including officers Christopher Hall, James Beare, and Charles Jackman, pilot Andrew Dyer, artist John White, assayer Jonas Schutz, several miners, two supercargoes, and ten gentlemen. Once again, no landing was possible when Greenland was sighted on July 4, but a landfall was made on July 17 at Hall's Island, the source of the tantalizing ore, at the northern entrance to Frobisher Bay. Disdainful of mineral prospects there, Frobisher proceeded up the Bay to Countess of Warwick (Kodlunarn) Island on July 19, where he set miners to work, and searched along the north shore of the Bay for the crewmen lost the previous year. Several contacts with the Inuit led to bloodshed, and ice conditions precluded any pursuit of the Passage, for which the expedition was inadequately provisioned. On August 23, Frobisher sailed with 158 tons of rock and three Inuit captives (a man, woman, and her infant), and reached England on September 23. The Inuit, immortalized in portraits by John White, soon died. The Queen, nonetheless satisfied with Frobisher's achievement, named her newly claimed domain Meta Incognita, a name still applied to the peninsula forming the south shore of Frobisher Bay. A third and much more ambitious expedition left Harwich on May 31, 1578, before the near-worthlessness of the rocks was established. Frobisher led a fleet of 15 ships and more than 400 men, a quarter of whom were to establish a permanent mining colony. Frobisher landed and laid formal claim to Friesland (Greenland) on June 20, and sighted Meta Incognita on July 2. However, he was driven south through stormy seas, and spent nearly three weeks beating westward up "Mistaken (Hudson) Strait" with eight of his ships, before recognizing his error, coming about, and reaching Kodlunarn Island on July 31. There the fleet gradually reassembled, albeit without the Thomas, which had retired homeward, and the Denys, which had been holed and sunk by ice. However, the loss of their cargoes of building material ended the colonizing plan. August was spent feverishly mining and loading over 1200 tons of hornblende at a dozen sites around the Bay, and erecting a small stone house as a token of possession, before making a hasty and hazardous departure on September 1 amid fog and storm. Frobisher's failure in August 1576 to establish that his strait was merely a bay helped keep alive hopes for a North West Passage, and might have secured backing for a second expedition even if the lure of gold had not become the principal goal of his sponsors. Frobisher's acquiescence in this shift, as well as his earlier career as a privateer and pirate, suggest that achieving fame and wealth counted for more than the means to do so. Thus, further opportunities for geographical discovery were left to successors such as Henry Hudson. A poor navigator, even given the uncertainty of longitude, Frobisher's acceptance of received cartographic wisdom helped perpetuate the confusion about Friesland, and caused successive generations to relocate his discoveries from Baffin Island to Greenland, the so-called Greenland Transfer. 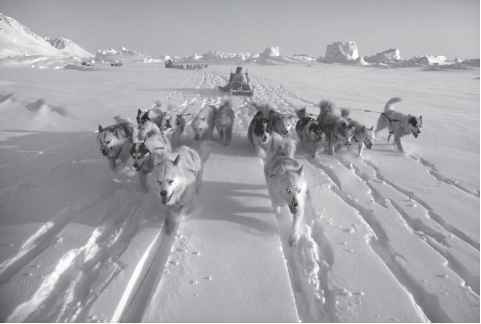 Reports of the Inuit's ability to survive in the Arctic helped sustain the notion of a navigable North West Passage. The failure of the gold mining enterprise, however, overshadowed the geographical significance of Frobisher's Arctic voyages, which were mainly remembered as a £25,000 fiasco.